How would you like to get a proper hunting rifle for $209.99? That’s not a misprint. 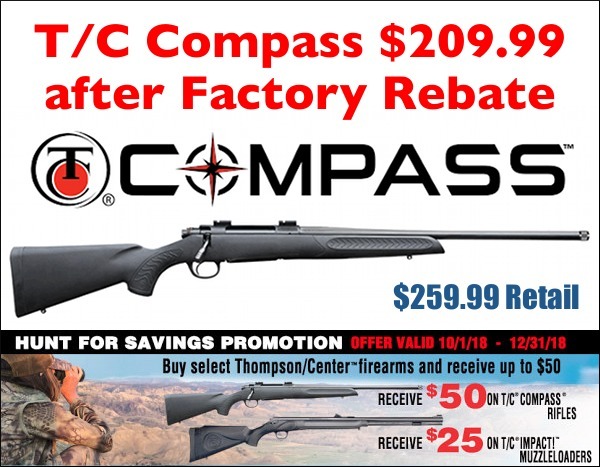 Right now Kentucky Gun Company is selling Thompson Center (T/C) Compass rifles for $259.99 in seven popular chamberings: .204 Ruger, .223 Remington, .22-250, 6.5 Creedmoor, 7mm-08, .308 Winchester, and .30-06 Springfield. But it gets even better — these rifles qualify for a $50.00 T/C factory rebate. 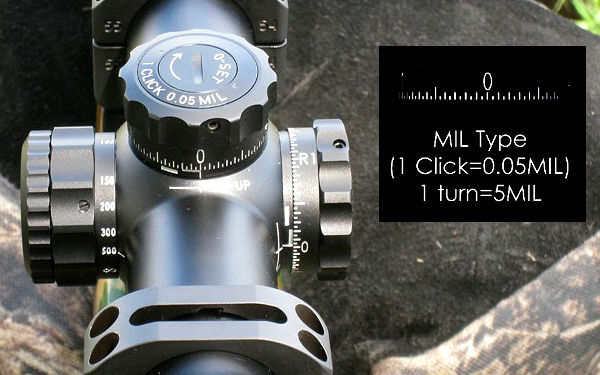 That lowers your net cost for the T/C Compass to $209.99 — less than you might pay for a barrel alone. This rifle is perfectly capable of harvesting game, and carries a strong factory warranty backed by Smith & Wesson. Put the dollars you save into optics and ammo. The 6mm Dasher was originally a wildcat cartridge. To make Dasher brass you had to fire-form (or hydro-form) 6mmBR brass. That all changed a couple years ago when Shiraz Balolia (of Grizzly.com) signed a deal with Norma to produce rifle-ready 6mm Dasher brass. Norma’s Dasher brass features a longer neck offering more seating flexibility (and slightly more capacity). 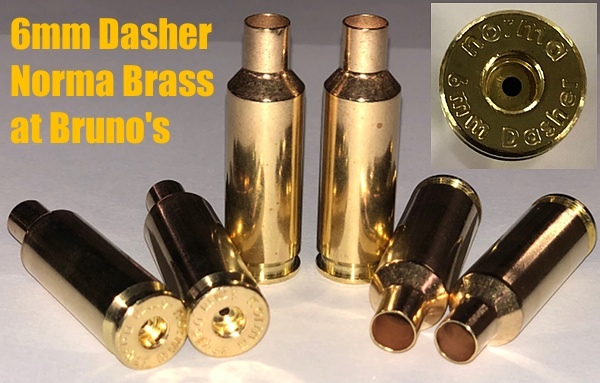 The latest Dasher brass is very good — capable of winning benchrest matches. If you have an older Dasher chamber, just trim the necks. Thanks to Lester Bruno, Norma Dasher brass is now available again. This is premium GEN 2 Dasher brass with the standard rim thickness. We believe Bruno’s is now the exclusive supplier of Norma Dasher brass. The brass is in the USA and will ship soon. Get this Norma-made 6mm Dasher Brass while you can. Price is $114.95 per 100 pieces. Factor in the savings (in bullets, powder, and time) by avoiding fire-forming, and you see why this brass is very popular. If you’ve been wanting to get a LabRadar Chronograph, here’s your chance. Starting Thursday 11/15/2018, you can save $60 on this very advanced piece of technology — probably the most sophisticated chronograph system ever offered to the general public. That’s notable because you almost never see this discounted below the $559.95 MAP price. Get the LabRadar for $499.95 with this Special Sale which starts on November 15 and extends through December 9, 2018. 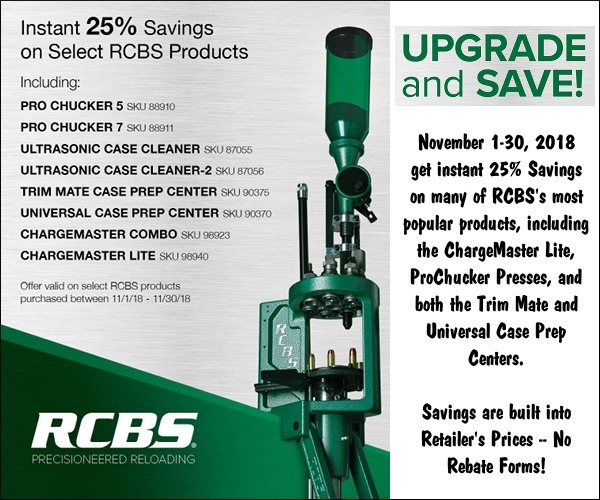 NOTE: you may be able to get the same deal from other vendors such as Creedmoor Sports, Bruno Shooters Supply, and Midsouth Shooters Supply, but you need to check. Right now we can only confirm the deal through TCK LLC on BuyMyLabradar.com. Check with other vendors on 11/15/18. 21st Century Shooting offers some of the best precision loading tools on the market. Our editors own and use many 21st Century products, including neck-turning lathe, concentricity gauge, hydro bullet seater (arbor press), and priming tool. You’ll also see these tools in the reloading rooms of National and World Champion shooters. Now you can get this world-class 21st Century gear at a significant discount. Through the end of November, save 10% off many 21st Century products with CODE FALLNOV10. Use that code at check-out. When you’ve filled out your order, type the code in the Coupon Field, then click the button labeled “Redeem Coupon”. That will confirm “10% off all online orders”. You won’t find a better deal on Nikons anywhere. These are Nikon-certified, factory-refurbished scopes. This is a good choice if you’re looking for big-name quality at rock-bottom prices. Good option for a hunting or varmint rifle. 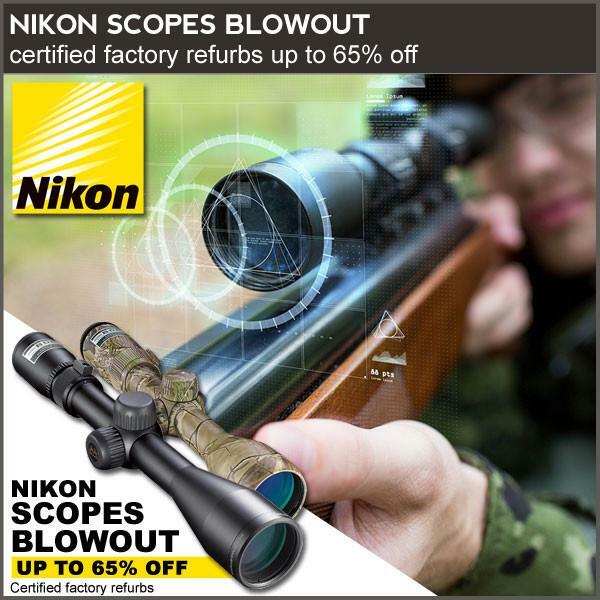 The savings on Nikon optics are up to 65% off retail. NOTE: all these Nikon refurbs have been refurbished to Nikon Factory specifications by Nikon, Inc. and are covered by a 90-day limited warranty. Sale refurb optics start at under $80.00. 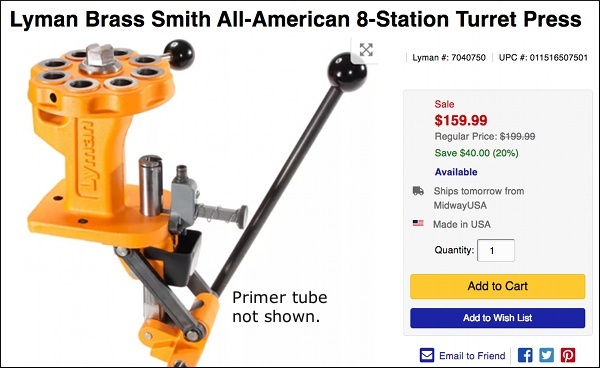 Right now you can get Lyman’s new All-American 8-station turret press for just $159.99. That’s a great price. This high-capacity turret press sells elsewhere for up to $229.99. The Lyman offers more die stations than the 6-station RCBS Turret and the 7-station Redding T-7. It also has a strong rear support that minimizes head flex. NOTE: Priming on the Lyman turret is done in the front; the image above shows the priming station but not the vertical tube which holds stacked primers. 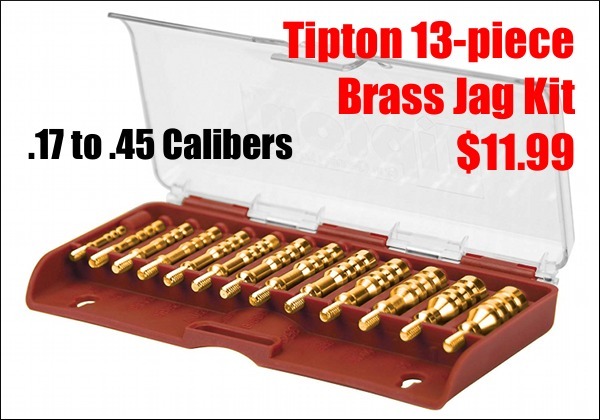 Here’s a great, budget-priced Jag Kit ideal for someone who shots many different calibers. This kit will cover just about any rifle or pistol bore size. Get 13 jags in a handy, clear-top fitted caddy for just $11.99. The kit covers everything from 17 caliber up to .45 caliber, with 17, 20, 22, 243/6mm, 25/6.5mm, 270/7mm, 30/32, 338/8mm, 35/9mm, 375, 40, 44, and 45 jags. The storage box features marked cavities for each caliber. The small .17 cal and .20 cal jags have a 5-40 threads, while all the remaining 11 larger jags have the standard 8-32 thread size. Share the post "Bargain Finder 164: AccurateShooter’s Deals of the Week"
Share the post "Optics Expertise: MIL and MOA Terminology Defined"